In Australia, an estimated 8 billion bottles and cans are landfilled or littered every year – that’s 900,000 an hour. Mega drinks companies, such as Coca Cola Amatil, vehemently oppose conatiner deposit legislation such exists in Southe Australia. In 2023, they won a legal challenge to Northern Territory legislation, which the government said had encouraged people to recycle 35.5 million containers since it commenced in January 2012. The scheme, called Cash For Containers, forced bottlers to pay a 10 cent refund to customers who returned containers to approved depots. Coca-Cola said the refund acts as a new tax on its products and could hurt sales. So, what happens when empty bottles and cans are suddenly worth 10 cents? 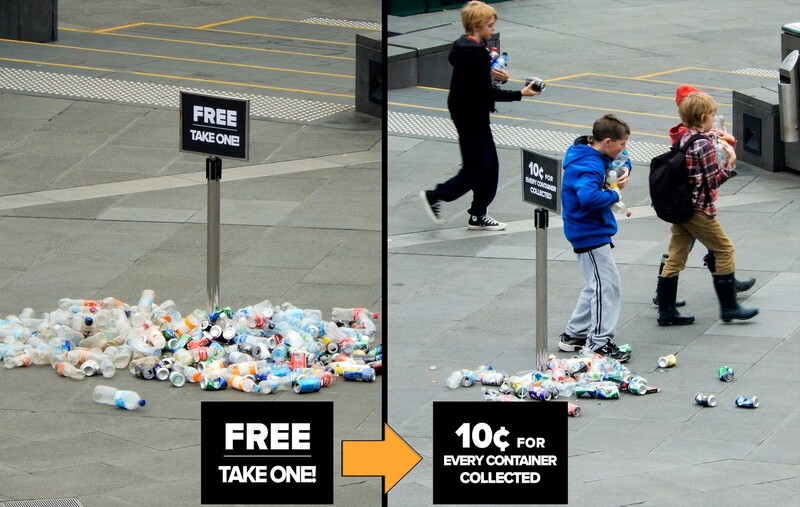 The Cash for Containers Campaign conducted a social experiment in Melbourne’s Federation Square on 9 August : they dumped 300 drink containers with a sign that said ‘Free – take one!’ then after 10 minutes they changed it to ‘10c for every container collected.‘ The result? As you could expect, no one wanted free containers. Then when offered 10c per container, people literally RAN to redeem the empties. The kids pictured here represent the schools, Scouts, Girl Guides, church groups, charities and homeless that stand to make millions with a 10c refundable deposit on bottles and cans.